What do you do with a site that has no rankings, no traffic, no authority and no links? It’s simple, get mad, roll your sleeves up and get to work. You have to dig deeper than everyone else…a lot deeper, and fight for every visit. But if you know how to research keywords and competition, have a decent vocabulary and are willing to get your hands dirty, it will work. You can increase traffic and business for your company. When I say ‘dig deeper’ I mean dig deeper into the world of keyword research. You have to start thinking about niche or specific keyword terms if you want the search engines to notice you. Maybe even hyper-specific if the category is very competitive. The reason for this is that the shelf space for the big keyword terms is taken so to speak. Picture the big box toy stores of your childhood. Now walk to the board game section. How many are there? Fifteen? Twenty? Why so few when there are hundreds or thousands of board games from around the world? Because there is only so much physical shelf space and the store can only afford to stock the best sellers. But all of that has changed with the internet. Adding shelf space is as easy as adding a page to your website now. If the niche game gets ordered, great, if it doesn’t, who cares? There is no real opportunity cost because it wasn’t taking the place of another game. But here’s the thing, it will get ordered because all it takes is one person in the world using a search engine and they can find your game. If your content is unique and valuable and you have optimized with the correct keywords. It doesn’t matter whether you’re trying to sell a game or just increase visits to your website, it works the same way. Let’s say you want to break into the “Internet Marketing” space and helping companies with SEO is your specialty. It would be great to rank for #1 for “SEO” since it is searched 673,000 times a month right? Wrong. There are at least two good reasons to stay away from putting all of your eggs in that basket. Number one, if you had the experience and budget to accomplish that, you wouldn’t be reading my blog and number two, it’s too broad and probably wouldn’t end up being a good experience for the visitors or your company. It’s probable that only 1 out of 10 of those searches are looking for an actual SEO company. The other 9 are looking for get rich schemes and will leave your site quicker than Baltimore cop at a Black Panther party. This will result in a high Bounce Rate. And that’s not good because the search engines will decide how often to continue showing your site based on visitor behavior. So what keyword phrase should I start with? A Longer tail phrase! Look at the screen shot above. We know “SEO” is out so what’s next? What keyword term is a little more realistic for us to build towards a top ranking? “SEO Company” looks good and…wait a minute…that’s what you are right? Okay, now we’re getting somewhere. But it’s still pretty competitive and Google reports there are almost 30 Million pages with that phrase. Alright, that’s a lot of competition and we’re a new site so let’s look at “SEO Firm”. Google says about 4 Million pages with that term. Getting a lot better but can we take it another step to ensure success? You bet. Now we’re talking, just 47,000 pages to battle instead of 30 Million. 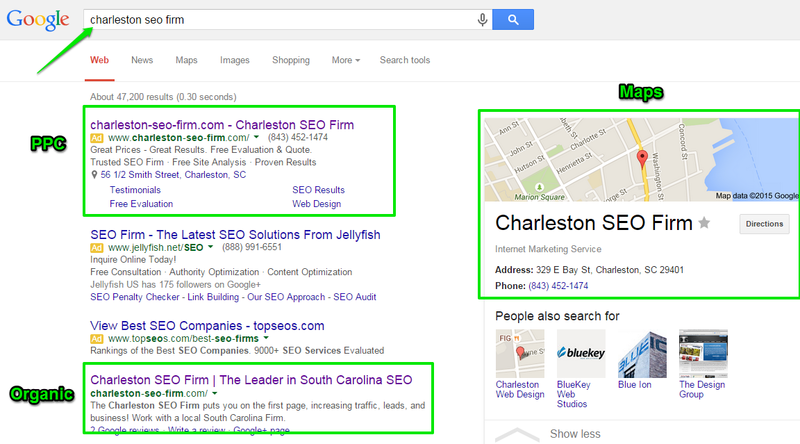 Let’s tell Google that we’d like to be #1 for “Charleston SEO Firm”. Easy right? Well, it still takes a lot of work but yes, it can be done! How can I be so sure? Years ago when we started this company, that term was our 1st goal. Get the #1 organic spot, top spot in PPC and a little love from the maps section and you’re dominating the page like we are below. Not only did we get the top spots for local SEO search terms but our site and message was a good fit for what the people behind the searches were looking for. We know that and more importantly, Google knows that because their Analytics tool tells them what those people did after clicking. They see a low “Bounce Rate”, a healthy “Pages Viewed Per Session”, and a great “Avg. Session Duration”. Why do they care about all of that stuff? Because they are in the business of making searchers happy with the results they are presented with. And their “happiness” is gauged by how long and how many pages they look at once they visit your site. And because people who visited our site were deemed happy, our domain authority goes up! That means that one day soon, Google may even try us out in the big leagues. That’s right, the next level, bigger keywords with much larger volumes of searches. How do we know this? It happened. 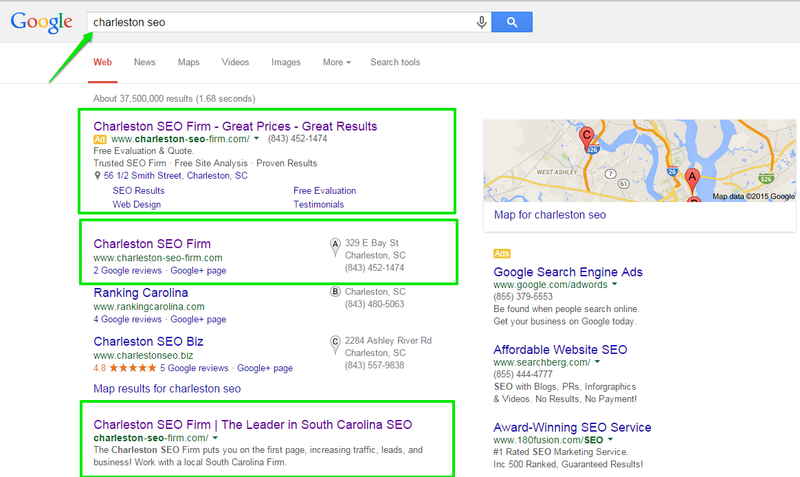 A few months later we were #1 for “South Carolina SEO Firm” and later, #1 for terms like “charleston seo ”. See? They tested us out without the “firm’ and we passed! That’s part of the reason we have been able to hold onto these top spots for so long. The UX or “User Experience” is as important as getting the rankings you desire. If you want Google to continue to present your website for top terms in your industry, you need to hold up your end of the bargain and make visitors happy. The example I just used was a common story of a local business using geography and Organic SEO in the form of good unique content to win the battle of building traffic, leads and business from scratch. This next example will be much more fun to talk about. You see, you don’t always have to be so serious while building traffic and authority for your site. Have fun with it, like I did and you might be surprised when you see the results. Best SEO Company in the World! As you can see above, I got the top spot for that highly coveted phrase. But here’s where it gets interesting. People actually found it, read it and liked it. How do we know that? You got it, Google and their Analytics saw a low “Bounce Rate”, a healthy “Pages Viewed Per Session”, and a great “Avg. Session Duration”. So, how does that help me? The increased Page Rank or “Authority” gave the page the muscle to start ranking well for variations of the title. When I noticed that traffic was increasing for that article, I wanted to know what keywords people were using to find it. 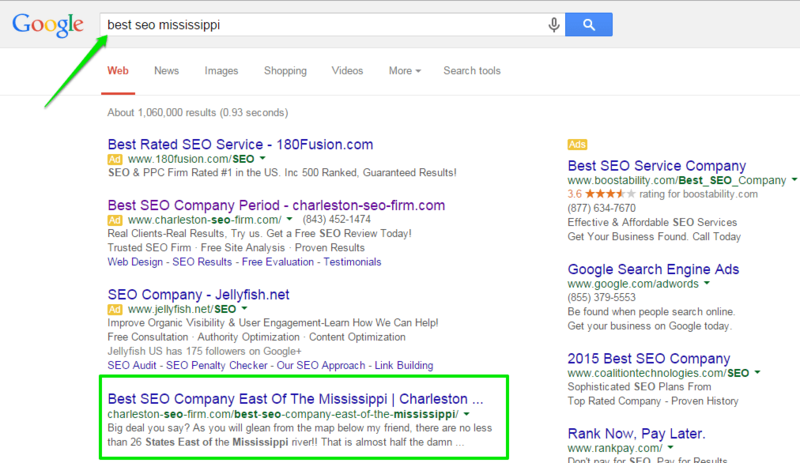 That’s when I discovered that my article was now ranking #1 for “best seo Mississippi”! 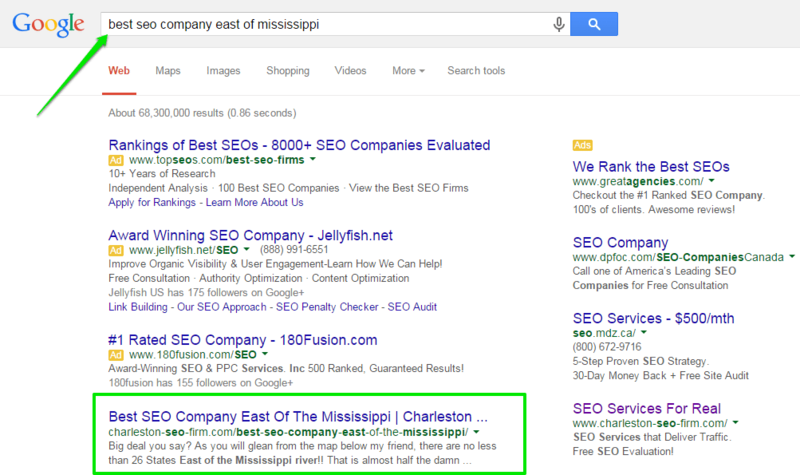 And just like that, I was the king of SEO in Biloxi! People were actually asking if we could help them with SEO. All from a farce of an article. Become a master of competitive keyword research. Gain insight into where there is opportunity for great content to fill a void in the current results pages. 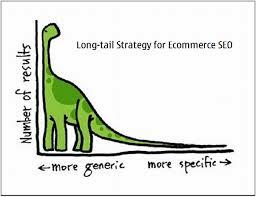 Use long tail keywords to match more specific searches which will give you a chance to rank and also address exactly what that person wants to see when they land on your page. Take your design, content, and UX up a notch above what the competition is doing. Your visitors will be happy, Google will be happy and you will be happy.